brrr. it’s cold outside! and m didn’t have any hats that fit him, so i whipped this one up. my handspun, mohair and targhee (i think), dyed for farm wool fiber club, back when that still existed. 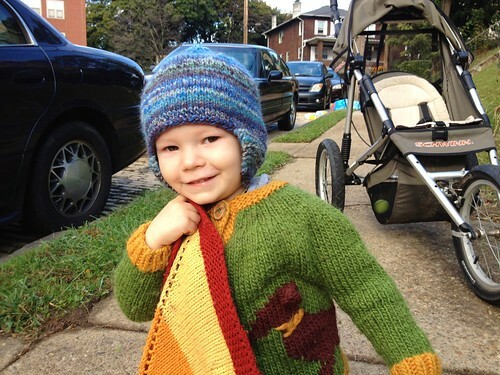 i’m going to make a pattern out of this one in multiple gauges – dk to bulky, i think. it’ll be a great hat pattern for handspun. i’m going to use the rest of this ball to make ben a hat. i’ll offer an option for a non-pointy top… but here’s a better view of the pointy top. ben’s will be a beanie. 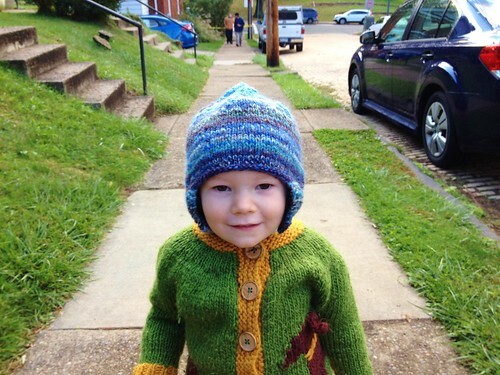 This entry was posted in cosyknitsliterally, handspun, hats, knitting, patterns, spinning by cosymakes. Bookmark the permalink. yes. i need to dig our mittens out still, too. but at least we have this one!